Firstly, let me tell you about Office's new collections! We have Blowfish Malibu, they have some really quirky designs and currently have a great sale on so you should check them out. And secondly we have these gorgeous On the sea black leather heels, they are abit pricey at £68 ouch! But of course you can get student discount so it brings it down a tad. You can get them here. Look at this fab competition!! 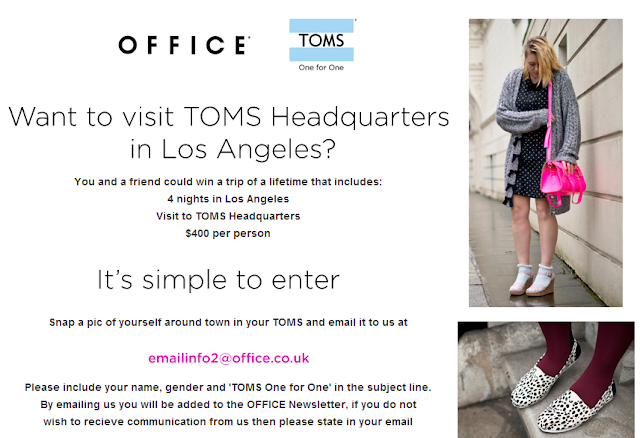 If you own a pair of Toms i'd definitely recommend taking part in this and it's really easy to enter.